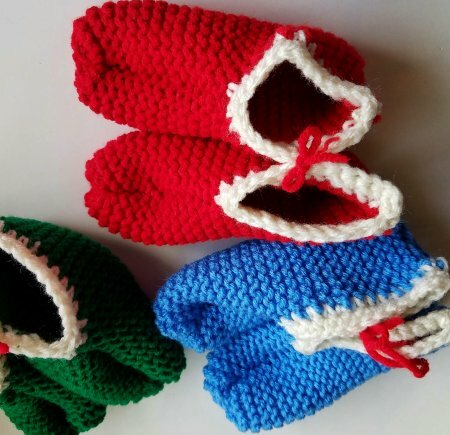 Check out Bev's BLOG ~ Bev's Journeyings for knitting, crochet, recipes, and news! Adult sized slipper will be approximately 8.5" long. and 8.5" wide before folding in half. 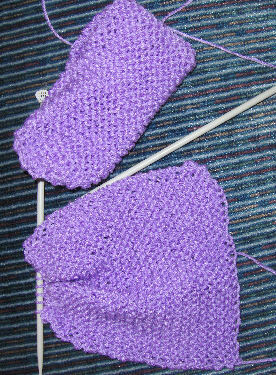 Gauge: 6 rows = 1" 4 sts = 1"
Cut 10" yarn tail, thread onto yarn needle. Gently remove the 6 (7) (9) remaining sts from the knitting needle and pull to gather. Fold slipper in half and stitch seams together about half way down towards heel, leaving enough room for foot to fit in opening. Back stitch 4 sts and cut yarn. Now stitch heel seam shut, back stitch 4 sts and cut yarn. Sizes: To adjust size add or subtract number of chains and rows. Gauge = 7 sts = 2" 2 rows = 1"
Row 1: HDC in 2nd chain from hook and in each one across, chain 2 and turn. er at beginning and end of row - do this for 2 rows total. Finishing: Cut 10" yarn tail, thread onto yarn needle. 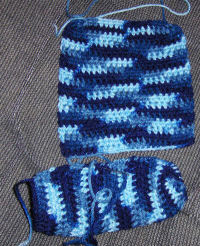 Weave yarn in and out of stitches and pull to gather toes. Fold slipper in half and whipstitch seams together a bit over ½ way towards heel, leaving enough room for foot to fit in opening. Backstitch 4 stitches to secure yarn then cut yarn. Now stitch heel seam shut in the same manner, backstitch 4 stitches and cut yarn. Turn slipper right side out.